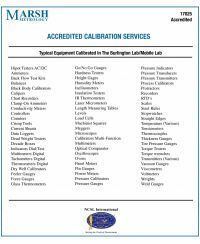 Marsh offers onsite calibration using their portable standards in the Customer’s Clean Room, for quick response, competitively priced accredited calibrations. This service is in addition to their Mobile Metrology Lab. Marsh Metrology has a complete set of master reference standards for field service applications. Our technicians are able to perform all calibrations and adjustments of Micrometers, Indicators, Callipers and the majority of all the gauging used in the manufacturing process right at your facility; thereby eliminating any disruption to your work flow or manufacturing cycles. Marsh Metrology has been accredited by ACLASS for a broad range of Parameters and Equipment under Certificate AC-1172. . Click here to view a Comprehensive list of Ranges, Best Measurement Capability and Reference Standards.